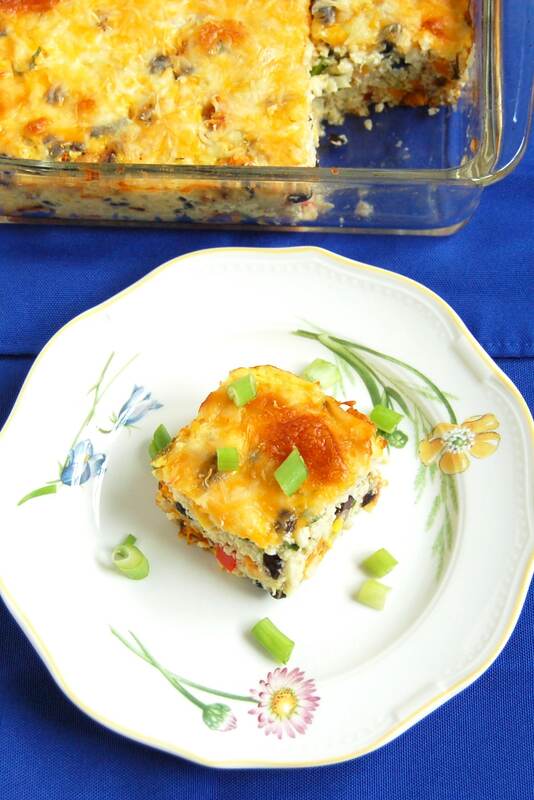 Feed your hungry family in an hour with this one-dish, grain-free Southwestern Cauliflower Rice Casserole packed with veggies, protein, and flavor! A few weeks ago, I went into my fridge to drain a package of tofu in preparation of that night’s dinner. I often forget to do this in advance, which leads to a mad rush come dinner time, but that day I remembered. What I didn’t remember, is that I had no tofu on hand. 😯 After cursing myself for not doing a better job with my grocery list when I made that week’s menu plan, I got to thinking about what I was going to make for our Meatless Monday dinner. After all, I have hungry growing girls on my hand! In honor of Earth day (April 22nd), we’re challenging ReDux members to show how they reduce food waste. Whatever you would normally toss, use it up. Share tips for reducing food waste in meal planning, prep, or using up scraps. My plan for that night’s dinner was to serve the tofu over a bed of cauliflower rice. (If you haven’t tried it, that’s a pairing you want to make – you can test it out with my Veggie Cauliflower Fried Rice with Crispy Tofu.) If you’ve ever bought a bag of fresh cauliflower rice, you know that it doesn’t have the longest shelf life, and I wasn’t about to let it go to waste. So I got to thinking what I could do with it. I had some sweet potatoes in my veggie basket on the kitchen counter, bell peppers, cilantro, cottage cheese, and shredded cheese in the fridge, corn in the freezer, and black beans in the pantry. Many of these ingredients are staples in my kitchen, but when I put them all together I knew I had the makings of a Southwestern/Tex-Mex inspired dish. I remembered a quinoa casserole I once made from a recipe another blogger adapted from Eating Well, and thought why not use the cauliflower rice as the base of the casserole. This isn’t the quickest recipe, but it still clocks in at just about an hour, which is pretty good for a weeknight. Even better though, is that this is a meal that can be prepped in advance so that all you have to do is cook it at dinnertime. You can even cook it the day before and reheat it the next night. It also makes for great leftovers to pack in the kids’ lunchbox, especially if they go to a nut-free, meat-free school like my kids do. You can also shave off about 20 minutes from prep and cook time if you leave out the sweet potatoes. Personally I love the combo of sweet potatoes and black beans (remember my Sweetpotato Black Bean Quesadillas?! ), but you won’t miss them too much if you’d rather have dinner on the table more quickly. I used frozen corn here, but when fresh corn is in season I intend to cut it off the cob instead. Nutritionally, there’s no difference between the two, so use what’s easier and what you have on hand. If you do include the sweet potatoes, be sure to account for the time you need to roast them before you put everything else together. Or better yet, roast them a day or two before so you can just throw them into the mixture. Although not shown in the pictures here, this Southwestern Cauliflower Rice Casserole is even better with a dollop of guacamole and salsa on top. Trust me! Or do what my husband does and add Sriracha! As with many of my recipes (like egg muffins and frittatas, Buddha bowls, baked oatmeal, etc), you can change up the casserole based on your family’s food preferences, what’s in season, and of course what you have in the fridge. Make it mediterranean with olives, sun-dried tomatoes, and feta. Go Asian with tofu, edamame, broccoli, and water chestnuts. I can keep going if you need ideas! Ok, are you ready to get to the recipe?! I bet you are. Let me know if you have any questions in the comments section below. And most importantly, enjoy! 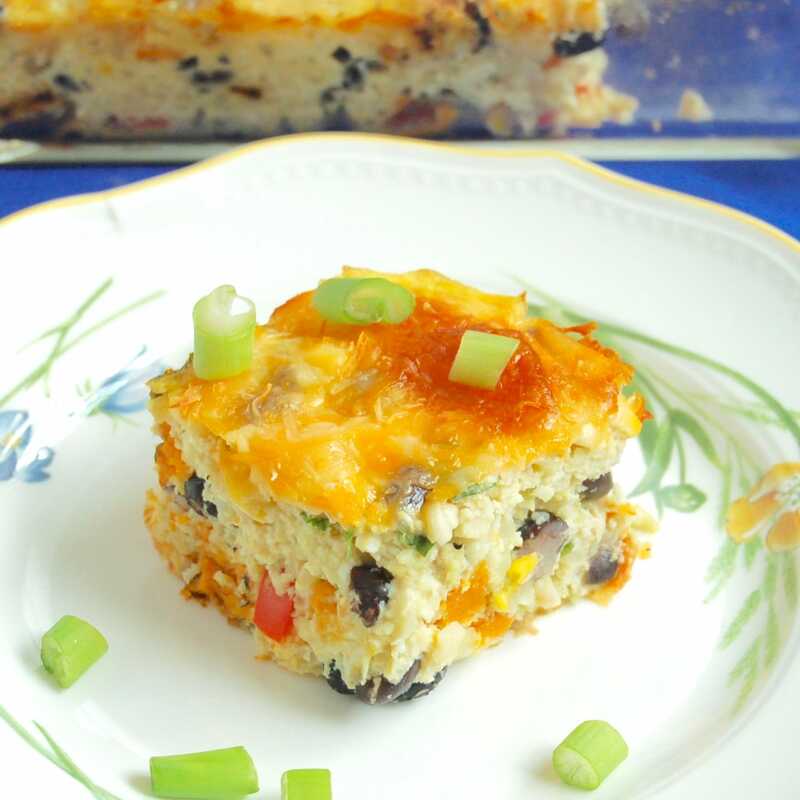 Feed your hungry family in an hour with this one-dish Southwestern Cauliflower Rice Casserole packed with veggies, protein, and flavor! This gluten-free, grain-free, and vegetarian recipe can easily be modified based on your family's taste preferences and what you have on hand in the kitchen. Easy to make in advance and reheat during the week or send leftovers for school lunch. Preheat oven to 425°F. Coat an 8x8" oven-safe casserole dish with cooking spray and set aside. Line a baking sheet with foil and coat with cooking spray. Toss sweet potatoes with olive oil, spread on baking sheet, and roast for 15 to 20 minutes, until browned on outside and tender on inside. Set aside to cool and reduce oven temperature to 375°F. In a large bowl, mix together the cauliflower rice, whisked eggs, and blended cottage cheese. To the rice/cottage cheese mixture, add roasted sweet potatoes, beans, peppers, corn, scallions, cilantro, baking powder, salt, and black pepper, to taste. Fold in all ingredients until well dispersed. Transfer cauliflower rice veggie mixture to prepared casserole dish and spread with a spatula so it's even on top. Sprinkle with cheese and bake for 25-30 minutes until golden brown on top. The center of the casserole should be solid and not feel jiggly. You can turn on the broiler for 2 to 3 minutes at the end if the cheese isn't browned enough. Remove from the oven and let rest for 5 minutes before serving. Top with guacamole, salsa, and/or sriracha if desired. This casserole serves 6-9 people depending on whether you're serving kids or adults and how big their appetites. For point of reference, I cut the casserole into 9 pieces and my husband and I eat 2 pieces each, whereas my girls eat 1 to 1 1/2 pieces each. What do you do when you forget to buy a key dinner ingredient? What cauliflower rice casserole variation would you make? Thanks so much Tara! There’s always something interesting that inspires what I make. So glad this one worked out as well as it did!! This is such a cool idea! We use cauliflower in a ton of things, but I’ve never thought of doing a casserole. Can’t wait to try it! Thanks so much Laura! I wasn’t sure how it would work out, but I was so pleasantly surprised. Hope you enjoy it! I love the idea of using blended cottage cheese. I never seem to use a whole container of ricotta, but cottage cheese will always get eaten at my house, so I should start using that! This sounds delicious! YES! I very often have half a container of ricotta that goes bad b/c of this. Hope you give the blended cottage cheese a try – it’s great on toast too! I love that you used cottage cheese in this! Sounds so yummy! Thanks! It’s such an underutilized ingredient and for no good reason – it’s delicious! I love southwestern flavored casseroles. This looks like an awesome dinner option! Thanks so much Emily. I hope you enjoy it! Well this looks divine and I am totally making it! Thanks Jessica! Thanks so much Sara! Can’t wait to hear how you like it! Such a delicious idea! We are big cauli-rice eaters and I really should try some more baked egg dishes. Never thought to combine the two! Thanks Alisa! I know there’s a lot of dairy in here, but I bet you could make an awesome dairy-free version ???? Never thought to use cauliflower rice like this! Way to save the day with this awesome dinner! Looks delicious! Pinning for later. Thanks Diane! Would love to know if you make it! There’s one thing I have not thought to do with cauliflower rice yet! A casserole is a great idea and makes for easy leftover meals too. Thanks Kelly! It’s definitely great for leftovers and there are so many ways you can make it so it will never get boring! This looks so good, Jessica! I could easily eat this every morning for a week. Thanks Danielle! Hope you give it a try soon! Sounds like a quick filling recipe! Loved all of your tips and pointers for the process of making this recipe! Thanks Mandy – so glad the tips are helpful. Hope you enjoy it! This dish looks so good and looks like a great way to use up veggies in my fridge! I so need to make this sometime soon!! Yes! It’s a great way to use up whatever’s on hand. So many ways you can make it your own. Let me know if you try it Lindsey! love the corn and black beans and cheese a winner to me! Thanks Deborah – I love all those ingredients too! What a great way to use cauliflower rice! That’s so smart! I’m definitely going to be trying it in a casserole soon! Thanks so much Liz. I hope you enjoy it! Thanks Whitney. Would love to hear what you think if you get a chance to make it! I wanted to press the Yum button a zillion times – this casserole looks incredible. I am on such a cauliflower kick but love all the other ingredient too! Thanks so much Mona! I hope you enjoy it – would love to hear! Yum! Recently I’ve been in love with cauliflower rice and I’m always looking for creative ways to cook with it. 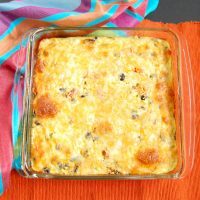 I have been too, although my hubby is over it a little :/ I hope you give this casserole a try and enjoy it! This looks delicious, Jessica! I love how you pureed the cottage cheese – I have never tried that, but am going to have to now to see how it changes the texture. Thanks Jodi! I tried it on a whim and was so happy with how it came out. The blended texture is just like ricotta! Hope you enjoy it! This looks like a great recipe! I can’t wait to make it! Thanks Denise! I hope you like it! I am very careful to reduce food waste–actually, one of my favorite things when roasting a head of cauliflower is to do a separate tray of the leaves! They are actually quite delicious! That is so awesome! Never thought to roast the leaves. Not sure why given that I roast kale! So smart! Thanks Emily! Can’t wait to hear how you like it!! We were both on the cauliflower rice train of thought this week! This sounds so good. I really love casserole dishes so I can’t wait to make this. Love this lightened up and veggie packed version! You can’t go wrong with Mexican recipes. Ever. Looks delicious Jessica. Great use for cauliflower rice! This looks delicious!! Thank you so much Whitney! Hope you give it a try soon! If you use Frozen califlower, don’t you cook according to package directions before putting in casserole? Great question Linda. I have not made this with frozen cauliflower rice, but I would recommend defrosting the cauliflower rice and then straining it in a fine mesh strainer or in cheese cloth to get rid of excess water. I would then use it uncooked the way I use the raw fresh cauliflower rice in the recipe. Let me know if you try it! Loved the creativity of this recipe! It was easy to make, very colorful, filling, and so healthy! I think it just needed a little bit more oomph in the way of salt or spice. Next time I will try adding in some spices and a dash more salt. Also, it reheated really well for leftovers. Thanks for the feedback Dana. I’m glad you enjoyed it despite not having enough oomph. I always say people should season to taste. Personally I don’t like things too salty, but too salty for me may not be salty enough for you!! The best thing about this recipe is that there are so many ways you can change it up and make different versions, and it’s definitely a plus that it reheats well!